The Cassini spacecraft currently orbiting Saturn has provided us with a wealth of discoveries. It’s mapped the surface of Titan, studied the age of Saturn’s rings, and found liquid water on Enceladus. But because it actively sends and receives radio transmissions to and from Earth, it’s position and movement can be tracked with extraordinary precision. Using the telemetry of Cassini, we’ve been able to determine the position of Saturn to within a mile. That level of precision also means the gravitational influence of other planets and moons can be measured by Cassini, and it may have felt the gravitational pull of the yet undiscovered ninth planet. The existence of the a ninth major planet in our solar system was first proposed by looking at the orbits of the outermost known bodies in our solar system. If they were truly at the outer edge of our solar system, one would expect their orbits to be randomly distributed. But instead they are clustered in a similar region, implying the presence of a large planet orbiting the Sun at 600 – 1,200 AU. Recently a team realized that if such a planet existed, its gravitational tug could be felt by bodies closer to the Sun as well. Normally this pull would be far to small to notice, but the extreme sensitivity of Cassini might make it known. So they analyzed the orbital data of Cassini. 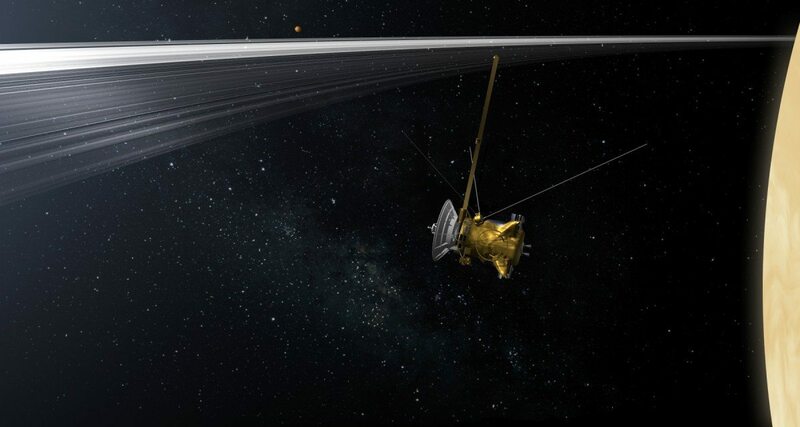 Taking into account the 8 known planets, the moons of Saturn and about 200 of the largest asteroids, they found Cassini’s orbit didn’t quite match up. This would imply something unaccounted for is gravitationally influencing the probe. When they added a ninth planet to the mix, they found it could agree with Cassini’s motion if the planet was about 600 AU from the Sun in the direction of the constellation Cetus. The result isn’t definitive. There are lots of things that could account for the motion of Cassini, and an undiscovered planet is just one of them. However if it is a new planet, with a distance of “only” 600 AU it should be detectable by current technology such as the dark energy sky survey or the Planck survey of the cosmic microwave background. If that’s the case, it’s only a matter of time before a new planet is discovered in our solar system. Update: Cassini project manager Earl Maize disputes the idea that orbital data points to a new planet in our solar system. The link to Earl Maize’s article might be broken? It seems to work for me. It’s actually supposed to be a link to a NASA press release. Maize didn’t write a rebuttal paper that I know of, just a statement that all of Cassini’s motion is accounted for by known factors.